Oligoacetylacetones and their imine derivatives behave as molecular clay ropes that are convenient to construct various nanostructures. One day, I was watching my daughters play with modeling clay. They were making various shapes such as a star, circle, heart, doll, and cup. Interestingly, they made these shapes by connecting, bending, bundling, and coiling elongated ropes of clay. This design concept is important because it allows two- and three-dimensional structures to be created from flexible and sticky one-dimensional materials. In fact, pottery has been made for thousands of years by coiling clay. Are similar methods also applicable to molecular science? If so, clay rope-like molecules would be convenient materials to construct nanostructures. 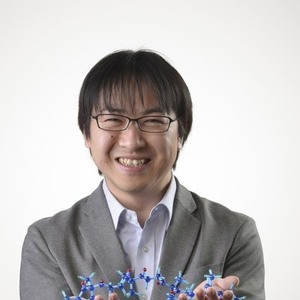 While there are already numerous flexible rope-like molecules such as normal alkanes and poly(ethylene glycol)s, the large entropy loss on fixing conformations and orientations always hampers their use in construction of high-dimensional nanostructures. To overcome this problem, we designed flexible and sticky molecular ropes by introducing many carbonyl groups onto aliphatic chains. In other words, carbonyl groups, which can reversibly form multiple types of interactions, were incorporated as an adhesive moiety to cover the enthalpy loss by a total enthalpy gain. Inspired by polyketone precursors involved in the biosynthesis of polyketides, we synthesized the ‘carbonyl ropes’ using silver(I) oxide-mediated oxidative homocoupling of the silyl enol ether of 3,3-dimethyl-2,4-pentanedione, an acetylacetone derivative. The resulting polyketones had an alternating 1,3-diketone and 1,4-diketone sequence unlike natural-type polyketones, which bear a simple 1,3-diketone sequence. Because the sixth position from any of the α-carbons in the new sequence did not contain a carbonyl group, undesired intramolecular aldol cyclization was efficiently suppressed. Therefore, we were able to synthesize carbonyl ropes of various length as pure forms up to tetracontane (C40) with 16 carbonyl groups. Unlike non-carbonylated alkanes, the oligo(acetylacetone)s were obtained as crystalline solids even for the dimer. Crystal structure analyses revealed that curved or S-shaped conformations were fixed by multiple hydrogen-bond and dipole–dipole interactions in the solid state. Furthermore, diketone-related transformation to furan and isopyrazole derivatives resulted in length and conformation changes of the flexible aliphatic chains. Notably, isopyrazole oligomers obtained by reactions between oligo(acetylacetone)s and hydrazine behaved as flexible, mutidentate, oligoimine ligands that could coordinate to metal ions. The flexible oligoimine ligands were used to construct metal–organic nanostructures by network formation and coiling. Complexation of the diisopyrazole ligand with zinc resulted in the formation of a grid-like coordination network. When the tetraisopyrazole ligand was treated with nickel nitrate, the flexible ligands coiled around hydroxo-bridged tetranuclear nickel clusters to form a cylindrical structure, just as pottery is made from clay rope. These results demonstrate modelling clay-like synthesis of nanostructures from oligo(acetylacetone)s and their imine derivatives as carbonyl and imine ropes. Such a macromolecule exists in nature as the most abundant protein in all animal bodies. Spontaneous aggregation of three chains result in stable rigid rod like structures, triple helices. The triple helicalmolecules spontaneously assemble in to fibrils and fibers that have high modulus, that are piezoelectric, act as semiconductors, transmit a variety of signals, especially force conduction and transduction, and their assemblies into super-supramolecular assemblies that give us form and function.